And I just made jam. In a heat wave. Anyway, the jam's made now. I've settled it happily in a box, taped it up and labelled it (jam! heavy!). I am sure we will enjoy it in Edmonton, where I don't think either cherries or peaches grow. 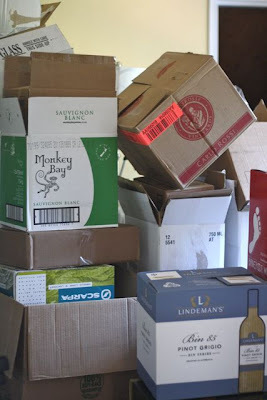 I don't have too much to say, because I'm really thinking about how I need to call the mover first thing tomorrow morning, and return my last novel to the library, and go help my mom clean the stove, and – oh, yes – convince my husband that I'm not frittering my time away writing a post. 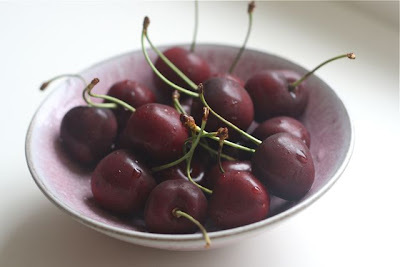 But I know I promised you this recipe and possibly some of you even did pit and freeze cherries in anticipation of making cherry peach jam. 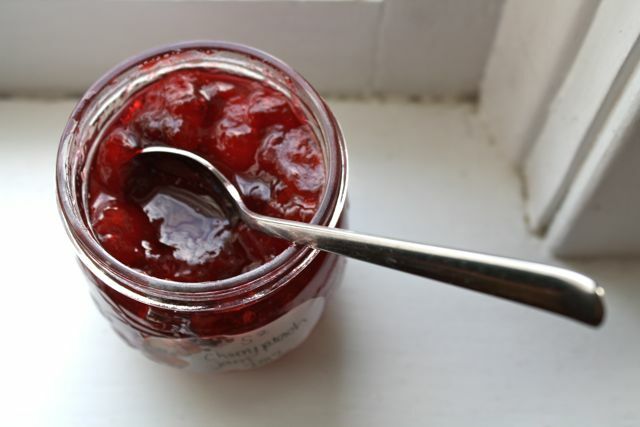 It's a wonderful jam: bright, pinky red from the cherries and melting peach flavour. My dad's friend Betty makes a jam like this, not to mention cherry blueberry and raspberry peach. She lives in the Okanagan, where this kind of fruit most definitely does grow. After a bit of tinkering, I've come up with this recipe. 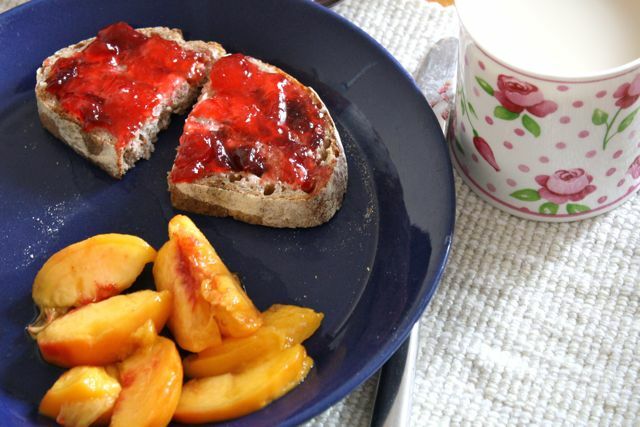 Spread it on your morning toast – try not to upset the husband and mother as they're just sitting down to breakfast surrounded by boxes and you're taking pictures, of all things – and be happy. The next little while will be overwhelmed by cardboard and packing tape, but I'll try to check in again soon. In a small bowl, stir the pectin and 1/2 c. sugar together. Set aside. In a big pot with a heavy bottom, stir the cherries, peaches and lemon juice together. Stir in the pectin and sugar mixture. Bring it all to a boil over medium heat. If it seems slow, turn up the heat a bit, but keep a close eye on it and keep stirring. While you're waiting for it to boil, get out a cereal bowl and soup spoon for skimming and set it aside. Once it's boiling hard, stir in the 7 1/2 c. of sugar. Bring it back to a hard boil, stirring often. Once it reaches a hard boil, let it boil for 1 minute. Stir often and watch it doesn't boil over! Take it off the heat (slide it off the element because it will be too hot and heavy to move anywhere else). Take your bowl and spoon and bring it closer. Stir (to prevent floating fruit) and skim the foam off for about 4 minutes or until there is no more skim or you get incredibly bored. Fill sterilized jars to 1/4 inch from the top, screw on the lids and process in a boiling water canner for 10 minutes. 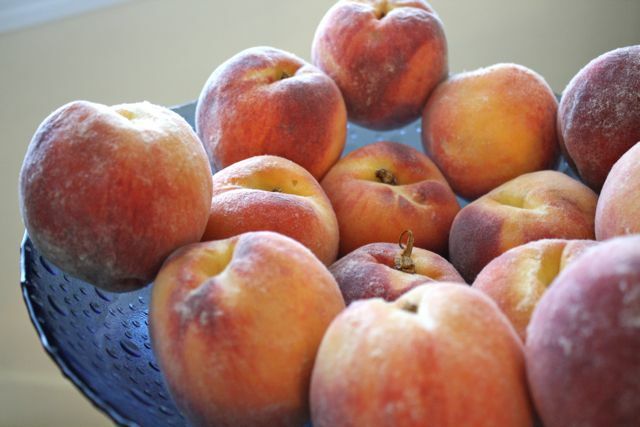 * Easy way to peel peaches: drop them in boiling water for one minute. Use a slotted spoon to take them out, and run cold water over or place in a bowl of ice water. Slip the skin off. ** I was too lazy to chop the peaches very finely. If you are, too, just use a potato masher or pastry cutter on them in the pot. Works like a charm! I live just outside of Edmonton on an acreage. Welcome to sunny Alberta! Yes, the winters are cold but the summers are glorious. We have a tree overflowing with wonderful sour cherries and I make gallons of juice and preserves from it. Drop me a line sometime and you're welcome to come fill a pail or two at next year's harvest! Good luck with your move! OK, better get back to packing up the last few things . . . I was in Edmonton this weekend and ate some delicious cherry tarts made with cherries from Corey's parents' backyard. I had no idea you could grow cherries in Alberta. If you enjoy making jellies, its the season for crab apple jelly - they are everywhere in Edmonton at this time of year. And I love making crabapple jelly -- looking forward to that, too! ... I've tasted the crabapple jelly made from Stephanie and I know for sure that it is gooooood! ... I hope the beginning of this new stage is going smoother and funnier than you expected... although I guess you also packed the sunshine… perhaps you can send it or bring it back soon! … Suerte y pulso! Those sound like fabulous suggestions, Karen, and I have no doubt that I will do both within my first week in Edmonton! Apparently, we will be living just a few blocks away from Duchess . . . and I can hardly wait to try it! Hi Stephanie, your jam looks great! This year I made Strawberry/Peach, and Apricot/Blueberry as well as lots of plain Peach. I put a net around my peach tree as we have a lot of deer in the neighbourhood, but it didn't help much. I miss the supply of fruit from your Dad's garden - my favourite combo was Cherry/Raspberry. I have tried your cherry/raspberry and I love it, too! ... hope you are settling down well in Edmonton! ... saludos locombianos!